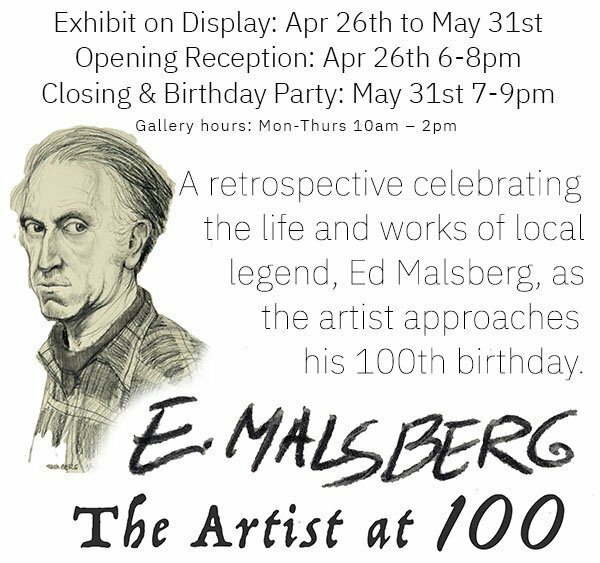 Join us April 26th 6-8pm for the Opening Reception for the exhibit: A retrospective celebrating the life and works of local legend, Ed Malsberg, as the artist approaches his 100th birthday. A native of Boston, Edward Malsberg graduated from the Massachusetts College of Art, in 1940; a Fine Arts major. He studied printmaking at the School of the Boston Museum of Fine Arts. During WW2, he served overseas in a topography unit and on the staff of Stars and Stripes European edition as an artist. After the war he began a lengthy career as a free-lance illustrator in New York in advertising and publishing. Edward’s clients included major advertising agencies and book publishers and the subject matter ranged from humorous, decorative illustration, to science, natural history, biology, physiology, children’s books and textbooks. He also won an award from the American Institute of Graphic Arts in 1968 for book illustration. These days, Edward is engaged in my lifelong passion for landscape painting in his favorite mediums, watercolor and pastel.